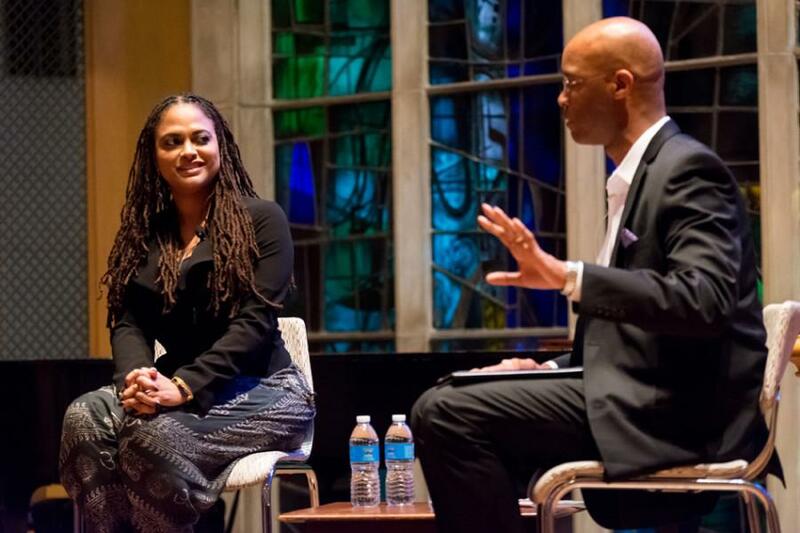 Ava DuVernay discusses her film, “Selma,” after it was screened at Alice Millar Chapel on Monday night. “Selma,” directed by DuVernay, depicts the 1965 voting rights protests. When the director of the film “Selma” visited campus Monday, she told the crowd of more than 700 there is a tendency to emphasize achievements of marginalized communities, which can distract from the pervasive problems of minority representation and leadership in media. From racism in the United States to film production, director Ava DuVernay discussed a variety of topics Monday night after a showing of her film “Selma” at Alice Millar Chapel on the one-year anniversary of the first day of shooting the film. Many films about the civil rights movement are from perspectives other than those fighting for their own rights, DuVernay said. DuVernay, known for directing TV shows and documentaries including “Venus Vs.” and an episode of “Scandal,” is the first black female director to have a film nominated for Best Picture at the Academy Awards. After the screening, Medill Prof. Charles Whitaker, who is also a board member at Students Publishing Co., The Daily’s parent organization, moderated a Q&A session with DuVernay. Topics discussed included the changing role of women of color in entertainment, DuVernay’s personal journey in the film industry and her experience working on “Selma.” Audience members also asked her about the challenges of making a historically-based movie and working as an artist. The film draws important parallels with contemporary events, DuVernay said, including the recent protests in Baltimore and the deaths of Eric Garner and Michael Brown. The event was hosted by A&O Productions, the Multicultural Filmmakers Collective, Inspire Media and multiple University departments. The film was intentionally screened in Alice Millar Chapel for its connection to the content of the film, said Dan Hoffman, A&O’s co-director of films. One of Northwestern’s chaplains was in Selma as an activist for civil rights, Hoffman said. The space is also regularly used for Martin Luther King Jr. memorial services.